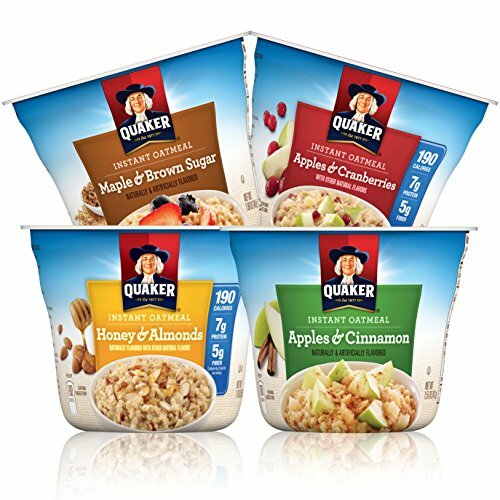 For energy to help take on your morning try a wholesome breakfast with Quaker Instant Oatmeal in a variety of flavors. Enjoy the sweet taste of flavors such as apples and cinnamon, cinnamon and spice, maple and brown sugar, or peaches and cream while the hearty whole grains help fill you up. Single-serving packets are easy to prepare for a hot breakfast on even the busiest morning. Simply empty the packet contents into a bowl, measure and add hot water, and stir. Your oatmeal is ready to eat only 90 seconds later. The packets are also portable, so you can take one with you and prepare a wholesome bowl of oatmeal anywhere there's hot water. 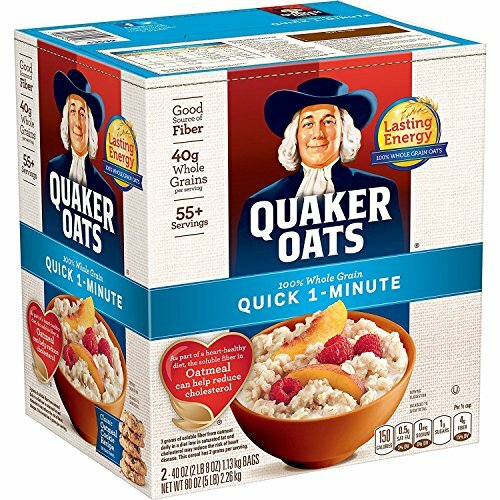 Even on busy mornings, Quaker Lower Sugar Instant Oatmeal lets you prepare a wholesome and tasty breakfast choice. The 100% whole grain oats provide energy you want to start your day. One serving of Lower Sugar Oatmeal contains calcium, iron, and other vitamins and minerals. 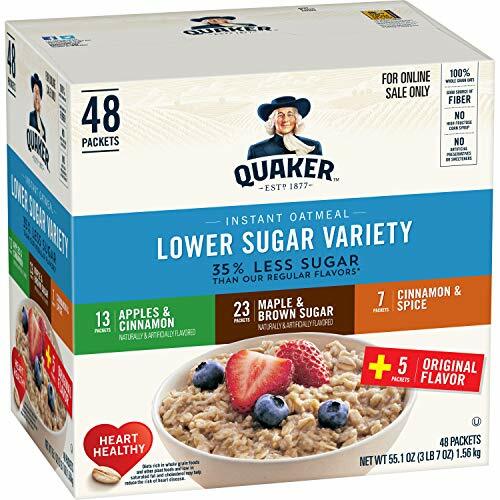 And you can savor the flavors of maple and brown sugar, cinnamon and spice, or apples and cinnamon with at least 35% less sugar than regular Quaker Instant Oatmeal flavor varieties. The individual oatmeal packets make preparing breakfast simple. Just empty the contents into a bowl, measure and add boiling water, and stir. Your oatmeal is ready to eat only 90 seconds later. The packets make your oatmeal portable as well, so you can make a hot and wholesome meal wherever there's hot water. You’ve never seen oatmeal like this. 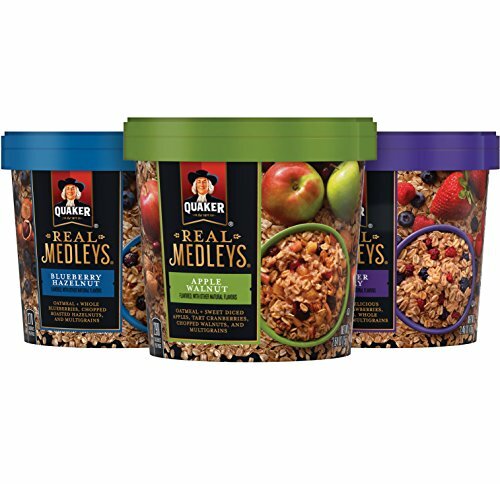 Packed with wholesome multi-grains and chunks of real fruit and nuts, Quaker Real Medleys oatmeal is an oatmeal experience beyond your expectations. Directions : Remove both lid and seal.Add boiling water to dark line inside cup, stir.Replace lid and let stand for 3 minutes, stir.Microwave Directions : Remove both lid and seal.Add water to dark line inside cup, stir. DO NOT COVER. Microwave on high for 45 seconds (for microwaves under 900 watts, add 10-20 seconds if needed). Stir and let stand for 1 minute. Adjust water for desired thickness.Additional space included in cup to prevent product from boiling over. 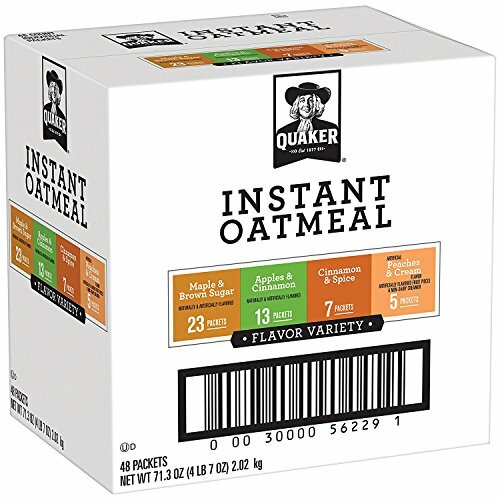 Quaker Instant Oatmeal is now even more convenient. Thesee Express Cups with disposable containers are a quick and easy way to a delicious breakfast wherever there is water and a microwave. Keep them at home, work, or enjoy on the go. This new variety pack includes 12 cups in 4 delicious flavors - Maple & Brown Sugar, Apples & Cinnamon, Apples & Cranberries, and Honey & Almonds. 52 oatmeal packets made with whole grain oats. Mornings, especially cold ones, get off to a healthy start with Quaker Quick 1-Minute Oats. The 100 percent whole grain oats are sodium-free, nutritious, and provide energy you need for the morning ahead. These Quaker oats cook in just 60 seconds , so you can have a healthy and filling breakfast choice on even the busiest morning. Dress up your oatmeal however you like, with fruit (fresh or dried), nuts, cinnamon, or simple brown sugar. 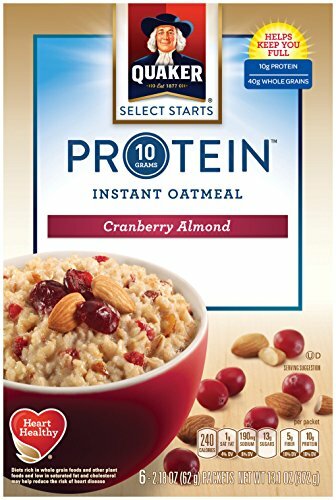 Put a skip in your morning step when you take the new Instant Quaker Oatmeal Cups Protein Cranberry Almond with you on your way out the door! Sweet and tasty cranberries blended with crunchy almonds help to deliver 10 grams of protein and 40 grams of whole grains, all in a convenient on-the-go cup. Breakfast just got better—and easier! Combine your favorite oatmeal toppings with 100% whole grain organic oats to make a hot breakfast option that's low in sodium and fat. 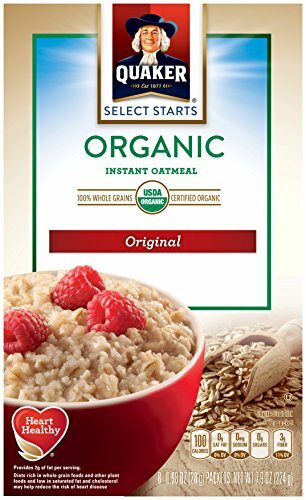 A good source of fiber, Quaker Organic Instant Regular Oatmeal is hearty and healthy. It only takes a few minutes to prepare, and individual packets contain the recommended serving size. Just add water or milk and heat for an easy breakfast choice of organic oats with your preferred toppings. 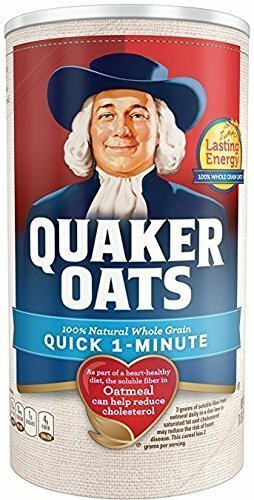 Looking for more Quaker Instant Oatmeal similar ideas? Try to explore these searches: Machine Red Hot Chili Peppers, Flight Display, and Teach Yourself Electric Bass. Look at latest related video about Quaker Instant Oatmeal. Shopwizion.com is the smartest way for online shopping: compare prices of leading online shops for best deals around the web. 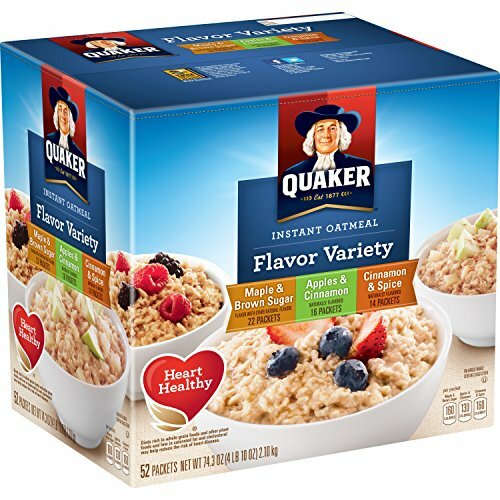 Don't miss TOP Quaker Instant Oatmeal deals, updated daily.